Modern huipiles from Santiago Atitlán are various and diverse, and for a long time, huipil styles in Santiago Atitlán have strongly been subject to fashion trends. 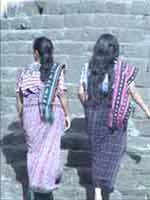 In a given season, women will copy and adapt the work of a single weaver or embroiderer that has caught popular fancy. The earliest huipiles from Santiago Atitlán, as far as can be told, were mainly white with a few widely spaced narrow red or purple stripes as well as red weft stripes. These were simple, undecorated except for embroidery around the neck hole and half-circle shaped yoke of red or magenta fabric in front and back. Around 1910-15 the first embroidered decorations besides the sunrays on the neckline appear: crosshatched motifs along the shoulder and in the front and back and carefully stitched small figures, which seem to imitate supplementary weft designs from other lake towns. Techniques of brocade- cuxaq - were known in Santiago, but these were unlike any others in Guatemala — not done by hand, as in other villages, but prearranged with string heddles and pattern shed sticks, called chacoy. The earliest were simple and had more to do with the texture of the fabric; plain weft lines laid down in white (known as sak cuxaq, white cuxaq) that would, with the coming of predyed threads, develop with increasing complexity. Another technique, known as pop cuxaq (mat cuxaq), contemporary with the sak cuxaq and possibly older, is not a weft design at all and involves the raising up of the warp to create a woven mat texture. In the 1940´s the warp stripes, now entirely purple, began to become wider and more closely spaced, and the small geometric figures gave way to symbolic bird designs of less rigid form. When coloured threads became readily available in the early 50´s, definite changes came about in the weaving and the embroidery. The possibility for new designs increased dramatically, and over the next half century a range of different styles emerged. The vertical purple stripes were as wide as the white ones by the mid-sixties, but afterwards they varied greatly. Supplementary weft cuxaq designs left the realm of simple texture and began, with different colors, to depict figures. The first, less complicated horizontal lines of geometric shapes (representations of natural forms such as volcanoes, leaves, ramitos de palo, etc, that are almost abstract) initially framed the developing embroidered work. They came to, however, take over some huipiles completely. The designs are increasingly fine, diverse and complex, portraying everything from flowers (stalk and all), little chickens and clusters of grapes to ice cream cones. 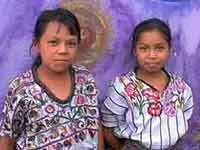 Though the average woman will wear a huipil woven with 4 to 9 different chacoy, some weavings have had up to 32. At the same time the embroidery became more and more realistic, covering the huipiles with flocks of birds and flowers that eventually broke from the confines of the framing lines. During the 70's and 80´s, new bright neon polyester threads were being used in the embroidery and weaving, and bright flashy birds and flowers jumped out of crowds. The old neckline persisted, covered with flowered decoration or birds, but eventually in the mid eighties disappeared into the foliage in all but the most conservative huipiles. Today the styles of new huipils change with the season, according to popular whim. Huipiles with cuxaq or with embroidery are equally common. Some are covered with turkeys (a universal symbol for wealth), large exotic flowers and birds from books, or carpets of little tiny flowers of all of the same colour. Machine embroidered necklines have been sold in the market since the mid-70, and today some huipiles are completely embroidered by machine. Revivals of old styles have occurred and modern interpretations of these variously combined and rearranged: outrageous orchids framing simple bird motifs and crosshatching, traditional necks on huipiles encrusted with introduced embroidered Mayan glyphs, etc. Background colors can be blue, lilac, or pale green as well as white, and the stripes can be purple, black or nearly nonexistent (most are narrow at this moment in time, spaced at about an inch apart.) Since the introduction in the mid-eighties of seed bead jewelry, glass beads and bugles have been used to embellish the embroidery on clothing, especially in the last few years. Some master beaders have covered their huipiles with beads. Cofradia huipils (nim p'ot, big huipils) from Santiago are much more conservative, undecorated and with the old style of neckline. The stripes can be narrow or wide (according to the whim of the wearer). The huipils are long and worn hanging over the corte. By the mid 60´s there was more jaspe than red in the cortes. In the 70's some women were wearing a non-village specific plaid-looking polychrome. The jaspe-striped corte has, for the last 15 years or so, no longer been exclusively red, coming in a whole spectrum of tones and shades. The corte weavers in Santiago Atitlán have earned fame for their skill, and most often there is a long waiting list for commissions. Fine rayons and coloured glitter threads are used, and the jaspe figures have become finer and finer, some only a few centimeters wide. One corte can have up to twenty or more different ones, hardly repeated, that represent any number of animate and inanimate objects (such as: volcanoes, pepitoria, animals of all kinds, birds, girls with tinajas, letters spelling out the name of the woman for whom it was commissioned, etc). A brand new Atitlán corte will cost 800 quetzales or more. Women in Santiago Atitlán wear their cortes without belts wrapped and tucked around the hips.